Proposals to protect 32 treasured green spaces in South Northamptonshire are currently subject to public consultation. Last year South Northamptonshire Council (SNC) asked people in the district to nominate spaces which they felt should be protected as part of the production of the district's Local Plan Part II. The Local Government Review in Northamptonshire has required the Leader and the administration of Cherwell District Council (CDC) to reflect upon its future and consider what is best for its residents. Towcester's Community Fun Day takes place at the Islington Road Recreation Ground on Saturday, 26 May between 11am and 3pm. 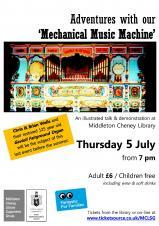 An illustrated talk & demonstration at Middleton Cheney Library. Due to unforeseen circumstances the next Parish Council meeting has been moved from 21st May to Tuesday 29th May. Due to unforeseen circumstances the Parish Office will be closed for a further few days. However, your emails to the office will be dealt with as soon as possible. Following a change in legislation, people threatened with homelessness in South Northamptonshire are being urged to contact the council as soon as they can. The Homelessness Reduction Act 2017 came into force this month and increases the number of people who are eligible for help. The Parish Office will be closed as from this evening (Friday 4th May) until Tuesday 15th May 2018. Contact details are on the office door to be used in an emergency. Calls to the office and correspondence sent during this period will be dealt with as soon as possible. Thank you for your co-operation. HTML5 validated. WCAG compliant. Page generated in 0.3622 seconds.